If you’ve read this blog before, it becomes readily apparent that I’m not a vegetable-centric cook. But after a long winter where the only vegetables at the farmer’s market were lettuces and carrots, the arrival of asparagus, ramps, and tomatoes yesterday really got me excited. The sign at Westmoreland Berry Farm’s stand announcing that there would be strawberries in two weeks didn’t hurt. While running errands later in the day, all I could think about was what exactly I’d do with my vegetable bounty. I settled pretty quickly on pasta but the details were still a mystery. I contemplated using pancetta or bacon. Then I wondered if I should add cream or cheese. In the end, I went for the route of simple. No pork products. No cream. No cheese. Just saute the vegetables in butter and use the pasta water as a sauce. It’s amazing what such a simple sauce can provide in flavor. In a word, it tasted like spring. 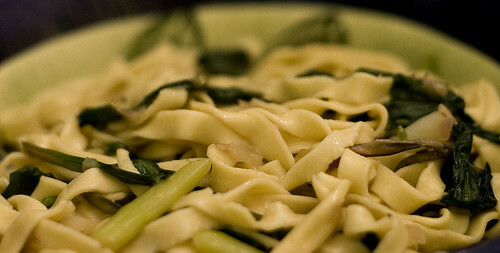 The pasta absorbed the flavor of the asparagus and ramps and tasted nearly perfect. The flavor was mild such that anything richer or heavier, like bacon or cream, would’ve over powered it. Break the bottom off the asparagus and discard the bottom. Use a vegetable peeler to remove the skin on the bottom portion of the asparagus. Cut the asparagus into 1″ pieces. Clean the ramps. Separate the leaves from the white parts of the ramps. Tear the leaves into 1″ pieces. Heat 2 tbsp of butter over medium heat in a large skillet. Add the asparagus and white part of the ramps. Season with salt and pepper. Cook, stirring regularly, until the asparagus and ramps begin to brown, 2 to 3 minutes. Add the shallots and cook for a minute more. Add the ramp leaves, season with salt, and cook until the ramp leaves are wilted. Meanwhile, cook the pasta in salted boiling water until slightly undercooked. Drain the pasta, reserving the cooking water. Add the pasta to the skillet. Add 1/2 cup reserved pasta water to the skillet. Increase the heat to medium-high and cook until the pasta water is mostly absorbed and the rest is thickened. Remove from the heat and add the remaining 1 tbsp of butter. Stir until the butter is incorporated into the pasta.